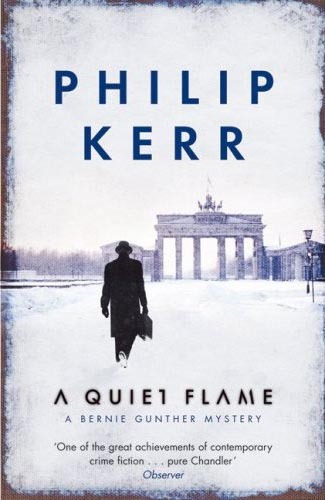 At the start of Philip Kerr's novel A QUIET FLAME it is 1950 and Bernie Gunther, ex-KRIPO homicide detective and Berlin private eye, arrives in Buenos Aires posing as the escaped Nazi war criminal Dr Carlos Hausner. He is summoned to a meeting with the Argentine President Juan Peron, and his beautiful charismatic wife Eva, where he has to admit that he is not a doctor, but a former Berlin policeman. The head of the secret police Colonel Montalban (that name seems familiar) realises that Bernie is the famous detective he admired during his pre-war trip to Berlin, and recruits him to help in an investigation. Greta Wohlauf, a young German-Argentine girl, had been murdered in a particularly gruesome manner that strongly resembled a case that Bernie tackled in the last traumatic days of the Weimar Republic; a case that Bernie failed to solve. Colonel Montalban believes the murder was committed by one of the thousands of Nazis who had found refuge in Argentina since 1945, and Bernie reluctantly agrees to help. The story then flashes back to Berlin 1932 as a younger more hopeful Bernie investigates the bloody murder of Anita Schwarz, a disabled part time prostitute, and daughter of a prominent member of the Nazi SA (the Brown Shirts). Colonel Montalban also involves Bernie in the search for another young girl, Fabienne von Bader, who has disappeared and whose father is a personal friend of the Perons. During Bernie's search he becomes involved with Anna, a beautiful Jewish girl searching for her lost relatives, and discovers more than he or his new masters bargained for. A sense of humour is not a quality usually associated with Germans, but Bernie Gunther's wisecracking cynical first person narrative makes this one of those rare books than can make you laugh and cry on the same page. "Was it the Nazis who made you cynical?" "No. I've been cynical since March 1915." "The Second Battle of Yypres." I really enjoyed this novel but perhaps it is not everyone's cup of tea as the story is harrowing and involves quite a lot of historical detail. Philip Kerr skilfully gives us portraits of real characters such as Juan and Eva Peron, Adolf Eichmann and Otto Skorzeny, blending them into the plot while asking searching questions about Argentina's anti-Semitism and the help it gave to Nazi war criminals. The novel works well as both an intriguing mystery, a love story and as an instructive history lesson. I know that long flashbacks and back stories are meant to hold up plot development, but I particularly liked the vivid portrayal of 1932 Berlin with all the turmoil, violence and decadence at the end of the Weimar Republic. The back story for me was the best part of the book and it included the sad lesson that even those German Jews who had won an Iron Cross fighting for the Kaiser in the Great War and those in the police force were not safe from the Nazis. But of course two years later in June 1934 during the Night of the Long Knives even Nazis were not safe as Hitler, Goering, and the SS dealt with Ernst Roehm, the SA leader, his brown shirted thugs and anyone else they fancied killing. Kerr's portrait of Argentina is a chilling depiction of a depraved brutal country dragged down to the level of its most despicable guests, welcoming their Nazi ideas and methods, but adding a few variations of their own. A QUIET FLAME is more than a crime fiction book and makes a good case for crime fiction as an educational tool as well as mere entertainment. I highly recommend this excellent book especially if you want to learn about events a lot of people would like to forget, or even deny happened.